Durham have become the first county to face England and Wales Cricket Board punishment for breaking the Championship's salary cap regulations. The county have been fined £2,500 and handed a series of points deductions for a lowest grade category one breach. 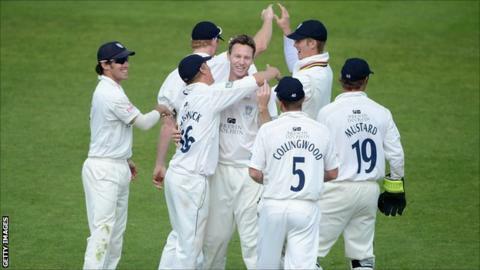 Geoff Cook's side have been given a two-and-a-half point penalty in the County Championship for 2013. In addition they have received 0.25 point deductions in Twenty20 and 40-over competitions. Under the team salary payment regulations, introduced in 2010, first-class counties must keep their total playing staff spending within the £1.8m bracket. "The team salary payment regulations were introduced at a time when Durham was enjoying particular success and seeking to secure the long-term commitment of key players," a Durham statement said. "In its submission to the ECB, Durham CCC explained the difficulties faced by counties who wish to remain competitive in all competitions and produce players for England. "In particular, the lack of certainty relating to players in the England system means that it is impossible to have absolute certainty around the final salary bill." However Durham's compliance with the ECB in reporting the breach ensured they received a reduced sanction. An ECB statement said: "The tribunal concluded that the sanctions in accordance with the regulations should reflect the fact that it was Durham who notified the ECB of the breach and Durham had co-operated fully and openly. "The ECB has acknowledged that the club has at all times operated within the spirit of the regulation; declaring the breach to ECB at the earliest opportunity and co-operating fully with the ECB throughout the process." Penalties are graded in conjunction with the seriousness of the breach, with a category five offence resulting in a 25-point Championship deduction, and 2.5 in the other competitions. At all times, the fine - before any discretion is applied - is equal to the amount of the breach.